After talking with a few of my comic book reading friends, I've learned that the character of Ant-Man can be extremely polarizing. Some really like the character and some really hate him. But it can be more nuanced than that. First, you have to know which Ant-Man you’re talking about. There have been three men to carry the mantle, and all three have their shortcomings. 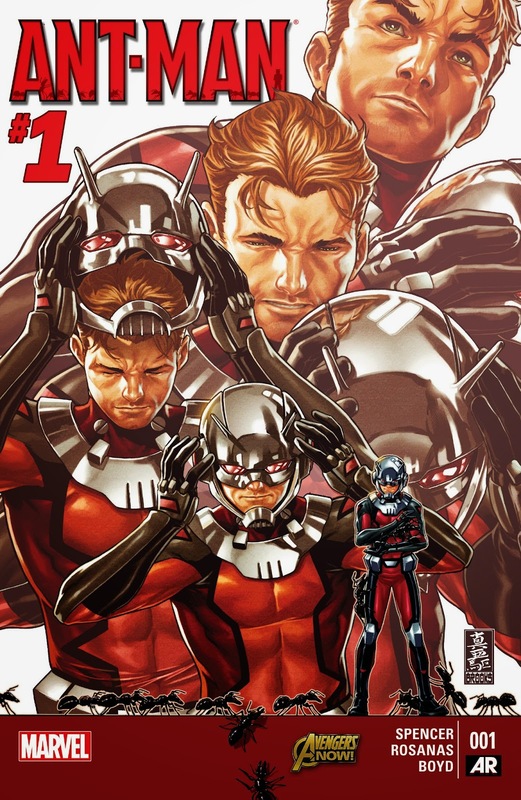 This volume of Ant-Man follows the second Ant-Man, Scott Lang. I find Lang to be quite likeable. I think my first exposure to him was in Brian Michael Bendis’ excellent series, Alias. In that series, he was the boyfriend of the series’ protagonist, Jessica Jones, for a short time. My next experience with him, and where I really began to like the character, was in the second volume of FF. He was brought in to lead the replacement Fantastic Four that were asked to stand in for the original team in case something happened to them while they went on vacation through time (and, of course, something did happen). In this series, he was really fleshed out as a character. You see a man that is in charge of some exceptional children and is scared senseless to fail them because he still is harboring a massive amount of guilt over the death of his daughter, Cassie Lang (the Young Avenger’s Stature). As the series concludes, we learn from The Watcher that the Lang bloodline just might be the perfect match with Pym Particles, the source of all the particle user’s ability to change their size. Between the conclusion of FF and the beginning of this series, there was an excellent mini-series, Avengers: Children’s Crusade. There were some interesting events and revelations in that series and among them, the resurrection of Cassie. The crux of this new series has us following Scott Lang and his attempts at trying to be the best father he can be for his daughter and to be a better man, in general. The writing, in these first two issues, has been sharp and witty. I wouldn’t expect anything less from the likes of Nick Spencer. This series begins just as his previous series, Superior Foes of Spider-Man, reaches its end and that series was a clinic in sharp and witty writing. His Lang is a flawed, but quite likeable man. He’s a man that feels guilt over his previous life as a thief and he feels that he’s not living up to his potential as a father. Cassie, on the other hand, loves her father so much and has all the faith and patience in the world that he’ll turn it all around. Spencer’s dialog feels very believable. You truly believe that Scott is a caring man wrestling with his insecurities and Cassie’s voice rings true as a girl that’s probably smarter than either of her parents care to admit. Now, on to the art of Ramon Rosanas. This book looks wonderful. Much like Spencer’s Superior Foes collaborator, Steve Leiber, Rosanas has a very clean art style and shows a great deal of skill at panel-by-panel storytelling. Anyone that’s read my reviews for any length of time knows that these are two things that I value most when evaluating an artist’s work. I like what he’s doing and hope to see him on this book for a long time to come. The verdict: I like what I’m seeing so far. This book has potential and it’s coming out of the gate very strong. Spencer is a proven talent and Rosanas looks like he may be an excellent choice for this title. I’m eagerly looking forward to the next issue and beyond. The score: 4 out of 5 stars. Review of "Return of the Super Pimps"